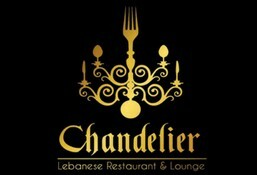 Chandelier is currently closed for delivery and it will open at . A healthy traditional middle Eastern soup of lentil spiced with coriander and cumin. Diced mixed vegatables slow cook in vegetable stock and served with coriander leaves. A classic creamy soup of tender chicken cubes. A selection of fresh seafood cooked in our special cream sauce. Finely chopped parsley, tomato, bulgur, and onion seasoned with salt, lemon juice and olive oil. Tomato, cucumber, lettuce, onion, radish, lemon, watercress thyme,olive oil dressing and bread. Romaine lettuce , cucumber, tomato and dry mint in a zesty lemon and olive dressing. Crisp iceberg lettuce dressed with lemon and olive oil dressing, tomato,oregano black olive, capsicum, white onion, feta cheese, cucumber. Fresh zaatar, tomato and onions, tossed with zesty thyme, sumak, lemon and olive oil dressing. Mixed lettuce with Caesar dressing,crispy croutons topped with Parmesan cheese. Half boneless chicken marinated in garlic ,lemon olive oil and Arabic spices served with French fries. Whole boneless chicken marinated in garlic ,lemon olive oil and Arabic spices served with French fries. 2 skewers of char-grilled chicken breast marinated in lemon garlic and mix of Arabic spices. Minced lamb mix with garlic, tomato, bell pepper mint spread with traditional Lebanese bread. 3 skewer of grilled minced lamb meat with parsley, chili sauce, garlic topped with tomato sauce. 3 skewer of minced lamb meat flavoured with finest Arabic spices. 2 skewer of succulent lamb cubes served with grilled vegetable and fries. Grilled lamb chop marinated in Arabic spices. Grilled lamb cubes, halabi, shish tawook and kofta. (Chef's Special) Grilled lamb cubes, halabi, shish tawook , kofta arayes and lamb chop. Checkpeas paste mixed with tahina and lemon juice. Grilled eggplant, tahina, olive oil and splash of tangy lemon juice topped pomegranate seeds. A thick creamy strained yoghurt blended and drizzled with olive oil. Slow cooked vegetable and rice wrapped in vine leaves. Hummus blended with finely chooped parsley and garlic. A rich grilled creamy combination of eggplant onion, tomatoes, capsicum and pomegranate seed. A selection of pickles vegetable including carrots, cucumber, chilli and olives. Fried potatoes with coriander and chilli, saute in hot pan untill the flavours absorbed. Akkawi cheese wrapped in spring roll wrapper and fried. Seasoned mix vegetable wrap in spring roll wrapper and fried. A pieces of spinach filled in pastry seasoned with onion, lemon juice and sumak. A breaded deep fried of melted mozzarella sticks served with sweet chili sauce. A delicious beef sausage saute with fragrant spice with lemon juice and pomegranate juice. Ground meat with various spice like cumin, sumak garlic, salt, pepper and tomatoes marinated in lemon and pomegranate juice. Chicken wings coated with garlic and lemon grilled to perfection. Marinated chicken liver saute in garlic, lemon juice and pomegranate molasses. Hummus topped with succulent meat. Fried middle Eastern meat balls, a shell of crush bulgur filled with minced meat and fine nuts. A traditional Italian pizza topped with tomato sauce and mozzarella cheese. Broccoli, mushroom, capsicum, onion, garlic, black olive, tomato sauce and mozzarella cheese. Grilled chicken, cherry tomato, mozzarella and tomato sauce. Grilled chicken, mushroom, alfredo sauce mozzarella and Parmesan cheese. Beef pepperoni, jalapeno, mozzarella with tomato sauce. Minced beef with jalapeno, white onion, tomato sauce and mozzarella cheese. Smoked salmon, fresh tomato sauce, baby rocket mozzarella and Parmesan cheese. Mixed fresh seafood, capsicum, garlic, tomato sauce and mozzarella cheese. Mix seafood toast in tomato basil sauce topped in penne pasta. Tagliatelle pasta topped with mushroom and our special cream sauce. Crispy bacon sauteed in onion and garlic toast with spaghetti pasta and beaten egg topped with Parmesan cheese. A traditional homemade Italian lasagna.